Easy Soft Pretzel Bites are an amazing crowd pleaser and appetizer for your next party. They are also perfect for kids lunches and treats when you have playdates. I have been itching to make this awesome pretzel dog recipe since one my favorite cheese place closed. They made the best mini cheese dogs in town and I miss them so much that I decided to try to make it myself. These Easy Pretzel Bites are the perfect way to make your own pretzels without surrendering your kitchen and your day to the pretzel gods. You can see my pretzel recipe takes a whole lot longer than this mini pretzel dog recipe. These mini cocktail franks are not that easy to find. I found these Nathan’s Beef Cocktail Franks at BJ’s Wholesale Club. I am sure that other grocery stores carry them. If you are calling ahead, use the words cocktail franks or cocktail hot dogs to speak the language of the grocers. They are really just mini hot dogs, but have been coined cocktail franks. 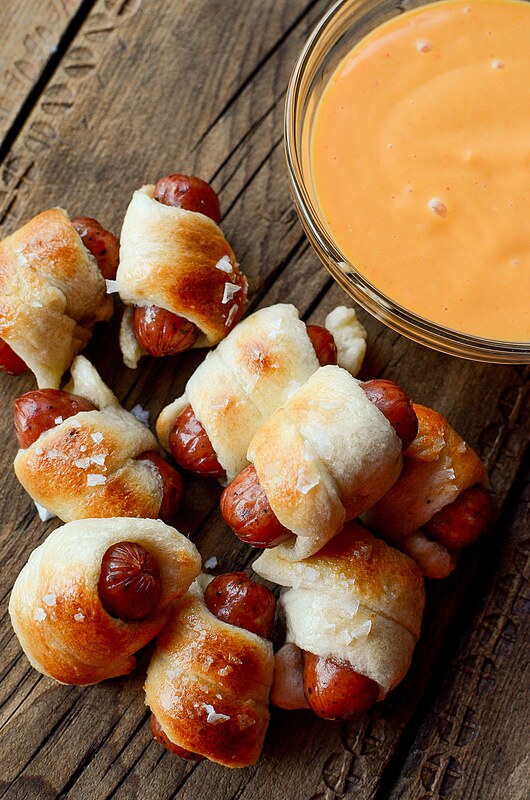 To be honest, these mini pretzel dogs do not need a dip, but if you feel so inclined to create one here are a few ideas and a recipe for the cheese dip in the picture. What to Dip Soft Pretzels In? This beer cheese recipe goes great with these mini pretzel bites. You can dip your dogs into this cheesy pesto avocado spread. Take your pretzel bites to the next level with this pretzel cheese dip. How to Make Cheese Dip for Pretzels? Combine 1/4 cup mayonnaise, two tablespoons of hot sauce like Frank’s Red Hot, ¼ cup Cheese Whiz, and one teaspoon of Yellow Mustard in medium mixing bowl. Don’t miss our kitchen tool and equipment buying guide. How to Make Pretzel Bites? The easy pretzel bites recipe is the perfect way to make your own pretzels without making a mess. They are really easy to make appetizers for a party. Cut the pizza dough is small strips, matching the number of cocktail sausages you have. Wrap the sausage in one strip of dough, from one end to the other. Tuck the end of the dough under the dough so that there is no end sticking out. Boil 4 – 6 cups of water and dissolve the salt in the water. Take the Water off the heat. Carefully, drop the pretzels into the water and let them sit from 10 to 30 seconds. Take them out of the water with a strainer spoon and put them on a parchment lined baking sheet. If the dough starts unraveling, just roll it up again. Bake them for approximately 10 to 12 minutes or until they turn golden brown. If after the 12 minutes are up and they are not brown enough, then broil for 1 to 2 minutes. Ovens vary and you will need watch them in the broiler. Remove from the oven and brush them lightly with melted butter. Sprinkle flake or sea salt over each pretzel bite. Cut the pre-made pizza dough is small strips, matching the number of cocktail sausages you have. Take them out the hot water using a strainer skimmer or slotted spoon. If the dough starts unraveling, just roll it up again when it cools down a little. Put them on a parchment lined baking sheet. Bake the pretzels for approximately 10 to 12 minutes or until they turn golden brown. While the pretzels are baking, microwave the butter to melt it. Most microwaves have a melt butter setting. To get the pretzels brown and crispy, broil them for 1 to 2 minutes. Ovens vary and you will need watch them in the broiler so you don’t burn them. Take your next gathering to the next level with these amazing appetizer recipes. These coconut crusted chicken tenders are delicious and a healthy alternative to breaded chicken strips. Rev up your tortilla scoops by filling them with guac and bacon in this amazing recipe. Make everything bite sized for your next party with these garlic stuffed mushrooms. Feel like breaking out the deep fryer, take your pickles up a notch by deep frying them. These look SO delicious! I bet my kids would LOVE these! My husband and I get these all the time at the mall and I always wondered the best way to make them. Thanks for sharing the way you did it! Thanks for linking up with delicious dishes recipe party! Do you not have to add baking soda to the water? You can just add salt to the water. That is enough to bring you pretzel texture. These would not brown at all. I’m wondering why we have to boil them. I wish I hadnt. You put them in hot water to give them a pretzel texture. Make sure you are putting them in the broiler for a minute. Then, coating with butter. You will fall in love! What brand sausages are those ?? LOVE the small portions PER PACK! Hope someone can help?! THANKS! I found them at BJ’s recently. They are Nathan cocktail hot dogs. These are so perfect for my next party. You are amazing. I tried this recipe last week. It was simple and delicious. It is a great tea time snack. I used Himalayan pink salt to sprinkle over it. It added such a pretty pink color and also enhanced the flavor. I use Himalayan salt in cooking and really like it. It is the healthy substitute of table salt. Making them right now as my contribution to a cocktail party we are going to. I did find they weren’t browning at 350 degrees so turned up the oven to 375 and they browned up better but still used the broiler a bit! I remade the recipe to help with the issue you had. Please check it out and let me know what you think. Thanks.